Pop Quiz – What is a Surf Hotel? What is a Surf Hotel? When we set out to create Surfers Lodge Peniche, we looked to create a prototype of the ideal Surf Hotel. We imagined a space for a traveler looking for a high standard of comfort, thoughtful design, and a full range of surf-related amenities. We wanted to combine the best aspects of a surf camp with the best aspects of a boutique hotel. We already had a lot going for us with the location – Peniche – one of the best, most consistent surf spots in Europe. Peniche has been a WCT Tour Stop for the last 5 years, thanks not only to the most famous world-class wave Supertubos, but also to the availability of solid alternative spots up the coast when the wind is wrong. Not just for the pros, the area is also perfect for beginners with an abundance of gentle sandy beach breaks. The varied coast creates favorable conditions somewhere within a short drive or even walk, no matter the wind or swell direction. Peniche is easy to access, just an hour drive from Lisbon, which is quickly becoming a low cost destination from many major cities in Europe. At the heart of Surfers Lodge Peniche is the desire to spread surf stoke to the world. We wanted to create a Surf School that provides week-long group lessons for all levels, like other surf camps, but also private lessons and programs sculpted to fit individual schedules and commitment. We encourage just trying it out to see if you like it! For the occasional surfer we provide board and wetsuit rentals; for the seasoned surf traveler there’s a place to store your board and hang your wetsuit. Learn about the area through our personal surf guiding; or explore on your own with forecasts and advice on the best spots to surf given the conditions. We’ve always loved the social aspect of a surf camp – adventuresome people from around the world, coming together to share waves and stories. 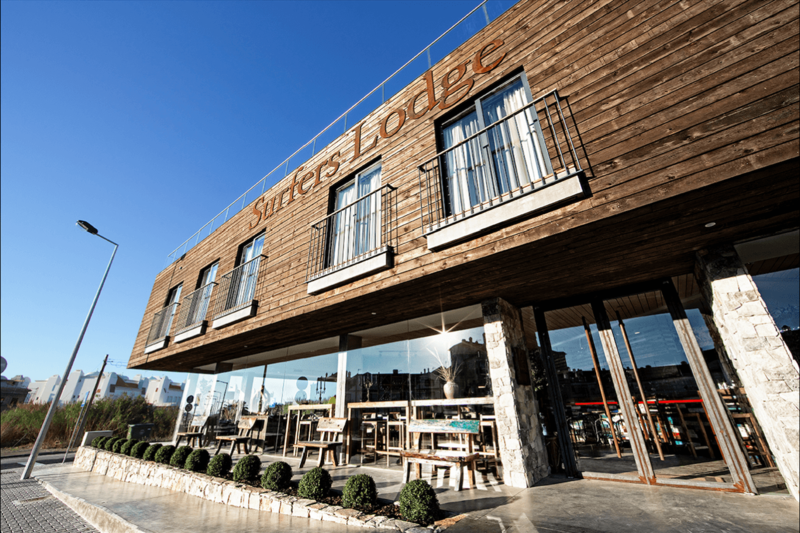 At Surfers Lodge Peniche you’ll meet people from all walks of life who are connected to surf in some way, whether first-time beginners or veteran surfers chasing swells, or even those just interested in the surf vibe. It’s always a fun mix and you’re sure to meet people you wouldn’t at a “regular” hotel. In the summer we have weekly Sunset Parties on the terrace and BBQs with live music in the backyard. The Lodge is perfect for families too, and we love to see all ages hanging out together in the cozy Living Room or taking surf lessons together. Surfing (as you may know) makes you REALLY hungry, so we have a full-service Restaurant to provide yummy, casual food, served in surfer’s portions. We try to use local ingredients wherever possible and we offer only Portuguese wines. The menu has both a healthy and a hearty side, making sure you’ll always leave the table satisfied. We wanted to offer all of the above in a space inspired by Vintage Surf Culture, designed with comfort as a big priority. We wanted to create a homey feeling, (living room instead of lobby,) centered around the fireplace and seriously comfy sofas like a Lodge in the mountains. At the same time we honor the luxurious hotel tradition of extra-nice beds and sheets. Each room has an impeccable attention to artistic details, with objects collected from family travels and always a Scandinavian sensibility to materials.